I have the pattern I want to make and have printed the foundation template. In order to get the king sized quilt I want, I am looking at lots of prints of the template, so printing in my printer wouldn't be a feasible option. I know I can take it to a print shop, but is there a paper that can run through their copier that is thin? What kind of paper do you use. There are lots of seams that are close together, so I want something that will be easy to get off. I just tried dampening the paper, but what a mess. 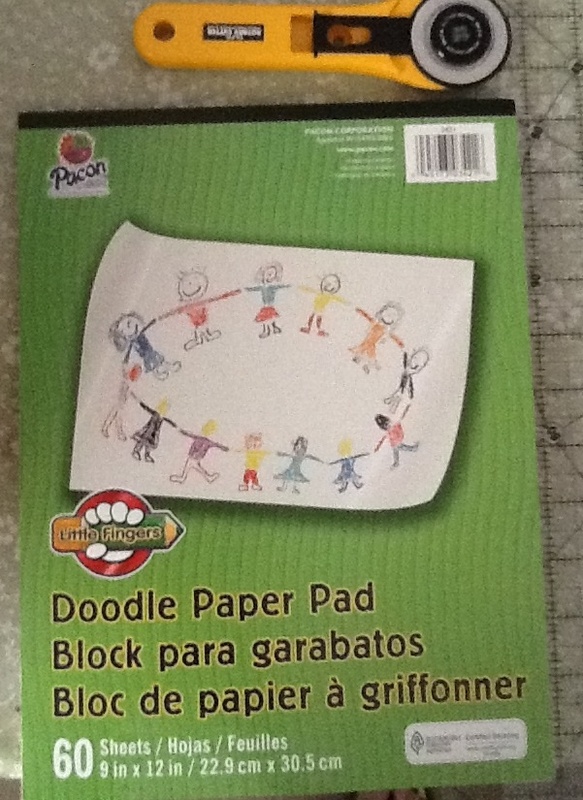 Several have recommended the doodle pads for kids that you can get at the dollar store or Wal-Mart. I got one the other day that is made by Crayola. It is 9 by 12 so had to trim it a bit to go through printer. But it is the easiest paper to peel off that I have used. I set the stitch close and you can fold and tear but really comes apart easily. I don't like all that picking little pieces off so am really pleased with this. I use the doodle pads from Dollar Tree. 60 sheets for $1! I just trimmed them down to 8 1/2", I didn't worry about the length . I used them for my periwinkle quilt and there was A LOT of pieces to it! You can just rip this paper off but out of habit, I always just fold on the seam before tearing. I have a pair of surgical forceps (also known as tweezers!) to get any of the little pieces that doesn't come out in the tear off. when I printed mine, I changed the options on my printer to Fast Draft and black ink only. You don't need high quality printing for your foundation papers. Last edited by auntpiggylpn; 06-19-2013 at 10:00 AM. However you decide to print it, use this: http://www.rickytims.com/online-stor...8-5-x11-detail You don't have to tear it out. It's great when making a lot of pp blocks. newspaper print you can get it at staples you have to cut it to size but just use rotarty cutter works great. and it is reasonable you can get right size paper from carol doak that works good too. It is an expense but I really like the PP paper that is made for PP by Golden Threads. It will go through a copier and is wonderfully easy to tear away and the alternative is to use the folded paper method which is PP but you don't sew through the paper, you fold it out of your way before sewing. I am sure there are tutorials on the QB for this method. That looks like a neat product. I will have to try it even though the paper is 100 sheets for 12.00. Thank for the info. Vellum. You can see through it, which has enabled me to use the fold-and-sew method. Instead of stitching ON the line, you fold on the line and stitch NEXT to it. No more tearing. However, if you still prefer stitching through the paper, vellum tears easily. Cheaper and easier to find than paper-piecing paper, also. I just use regular copy paper, use a smaller stitch length so it is really easy to tear off. Also, when I sew seams together I tear off the paper that would be included in the seam. As for using your printer - can you put more than one pattern on a 8 1/2 x 11 paper? Some printers use their copy machines and can charge a pretty penny for copying. It may be cheaper for you to buy an extra black ink cartage. God Bless the broken road that led me straight to you. I purchased the kind of paper that dissolves in water. I didn't have to take the paper out of the project, just put it in the washer and it all just washed away. If you have lots of copying call your copy place and ask if they can print on velum .. it thin paper that architects use to see/draw on as you can see the paper underneath. Many quilters shops carry rolls of paper that is very thin, architects use the same product as "trace". Velum is very similiar and comes on large size rolls for printing building drawings. I have enlarged and printed some P/P designs on large 36 in velum and larger. A good copy place can and enlarge and print onto velum if you ever have the need. I use lightweight (not scrapbooking weight) vellum for all pp blocks that don't have small intricate pieces (I use Stable Stuff for those). The vellum is the best I've found to use. I ordered a ream of it. shorten stitch length and tearing is much easier. I just use the cheapest copy paper I can find and greatly shorten my stitches, never had any problems getting it out. Does it clog the machine ? Sorry I'm sure it doesn't but it was my sudden idea when I read your reply. I just soak in either sink or bath until paper has gone. Then try to dry outside. Or in tumble drier. I use a paper similar to newsprint type, get it at a art and education store for teachers. It's cheap and easy to use. I have used Carol Doak's but found better deal with www.dickblink.com: 500 sheets (newsprint) for $3.86 (shipping costs more than that) total $12.51. Should last a good long time. It goes well in my printer when I scan copies. I always make & keep a master on regular paper. Love pp!! Also - if you use plain paper with a short stitch, I use a moist Qtip (not dripping wet) - and run the moisten tip down the seam line. After a few minutes, this will soften the paper slightly and easily pulls apart at the seam line without tugging on your stitches. Use the Dollar Tree doodle pads and trim the edges down 1/2", shorten my stitches and it works great. I am very interested, but when I click on the link, I go t an x-rated site. but have since decided it is the only way to go and just purchased 3 packages from Connecting Threads, it was on sale, to boot!!!!! !